The best sun-protection for your backyard, keeping Australian families safe and comfortable. Make your backyard the most enjoyable space possible and suitable for all seasons with a high-quality shade sail, offering premium protection against sun and rain. With our range of high-quality, expert-designed shade sails, you can have maximum UV protection and adequate shelter from rain that allows you to enjoy your backyard all year round, no matter what the weather conditions. Our first-rate shade sails are perfect for making your family space a pleasant, comfortable and safe environment, keeping everyone happy and healthy. Offering up to 98% protection no matter what time of day it is or how extreme the heat, our top-quality shade sails keep you protected all day long, all year round. Ultraviolet inhibitors prevent any harmful rays from penetrating the fabric, providing optimum protection against sun damage to the skin, such as sunburn and skin cancer. Air circulation beneath the shelter of your shade sail is improved by breathable fabrics, providing you with a comfortable, airy and well ventilated space that keeps you cool during summer. Lightweight materials allow easy handling, installation and removal, and expert construction means that your shade sail can last up to 10 years. Our shade sails range in size and dimensions so that no matter how big or small your backyard is, we’ve got the right size for you. Choose from a range of different shapes including square, rectangle and triangle designed for different purposes and tastes. Keep your backyard looking stylish or make choices based on the heat absorption properties of different colours. We offer two equally commendable choices for installing your new shade sail, with both an affordable installation service and do-it-yourself kits available. 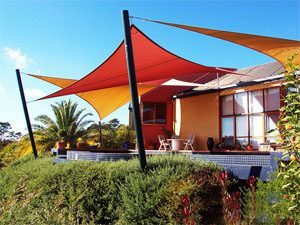 Melbourne Shade Sails installation service sets up high quality domestic and commercial shade sails in all suburbs across Melbourne. Guaranteeing a successful construction for maximum safety and protection, we install your shade sail efficiently and professionally in a service that is fast, reliable and affordable. Not only that, but we’ll give you a free consultation, measure and quote on all jobs. However, if you’d rather install your own shade sail, we make it easy for you. Everything you need including posts, structures, fabric, fittings and fixtures is included in a comprehensive, easy-to-use pack, complete with clear instructions that will help you to execute an expert installation. Make your backyard a safer place to be. Choose Melbourne Shade Sails for the greatest family protection and comfort.